We have been watching the gravy train of strong tropical disturbances coming off of the coast of Africa this past week. 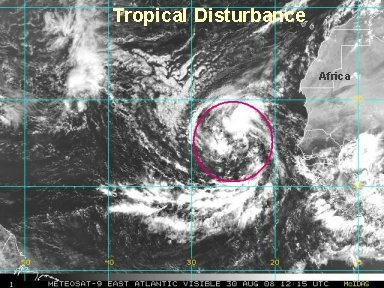 It appears that the one now just off of the coast of Africa is a good candidate for the next tropical depression. The surface circulaton is impressive and there is some convection associated with it. There's plenty of time to watch it. Last edited by Caribbean Traveler on Thu Sep 04, 2008 3:09 pm, edited 5 times in total. 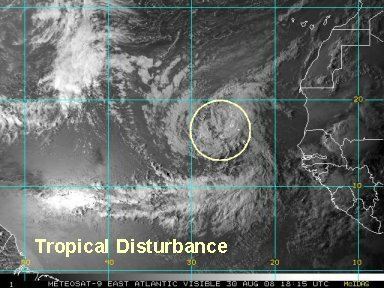 We still expect NHC to classify this disturbance soon. It has a well defined circulation and now some convection is building near the center of circulation. It's still a long ways out there! We still expect NHC to classify this disturbance soon. I think we said that the last update. 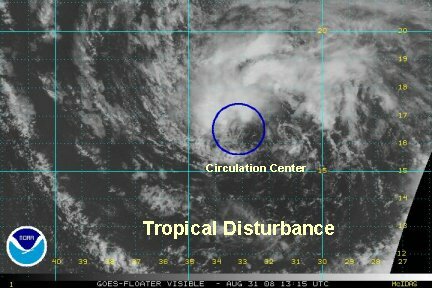 The disturbance is centered near 16.5 N / 33 W or about 2200 miles from Bermuda! The Quickscat microwave shows a closed circulation with 30 knot winds on the north side of the circulation. The visible satellite imagery shows a low with a vorticy spinning around it. This should be classified as a depression. We understand that NHC has its hands full with Gustav and Hanana, so we don't blame them for waiting to allocate resources on a weak system that far away. We just call them as we see them. With the high latitude of this disturbance already, Bermuda may be the only land area that could possibly be effected. 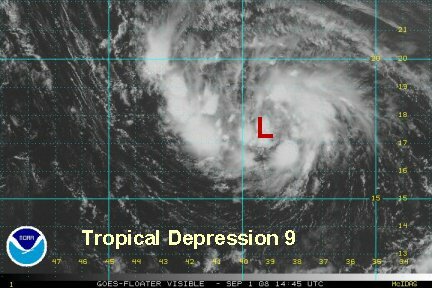 The tropical depression that we have been following since it moved off of the coast of Africa has strengthened and is "officially" a tropical depression now. Deep convection surrounds the center of circulation and this depression should become tropical storm Ike within about 12 hours if the convection continues to increase. The forecast models have had a change of heart. It looked like yesterday that a trough would pull it northward and keep it away from the Islands and U.S.. Now the high follows the tropical system westward, so everything has changed. There is a good chance that this will be Ike and become a hurricane. We may need to deal with this system by next weekend! NHC upgraded t.d. 9 to Ike. No surprise here. Ike looks organized and has top winds of 50 mph already. No changes to the forecast....heading generally west northwest toward the Bahamas by Saturday. 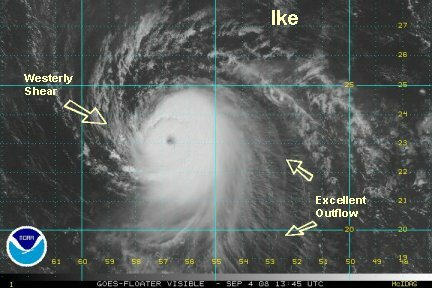 Satellite imagery shows that Ike is slowly getting organized. It is centered about 1100 miles east of the Leeward Islands. Banding is taking shape on the eastern side with deep convection building around the center. The forecast models show a strong high north of Ike. The high builds southwestward later in the week and may force it into the northern Caribbean Islands. Right now NHC's track has it moving into northern Cuba. Ike is slowly, methodically organizing. We are in total agreement with NHC's analysis and forecast at this time. We expect Ike to become a hurricane within 6-12 hours. At this time an eyewall structure is taking shape. The forecasts generally take it west, then possibly slightly south of west in the long term. This will be critical because it will mean the difference between threatening the northern Caribbean islands like Cuba or moving into the southern Bahamas and affecting Florida. We simply don't know yet. Reliable models are have both scenarios so far. 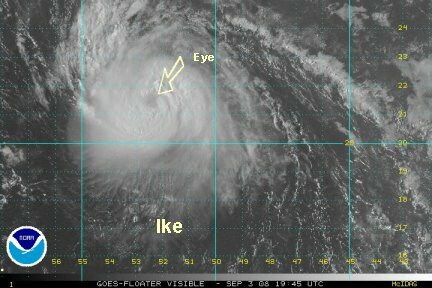 After looking very impressive on the satellite imagery last night, Ike's eye opened on the north side for a short while. It is now closing off again. 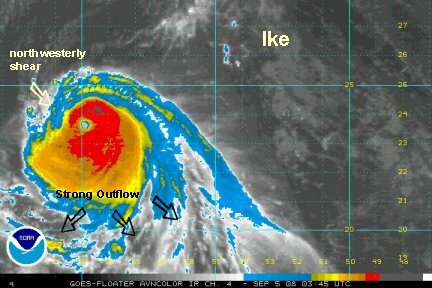 Ike is near hurricane strength at this time. 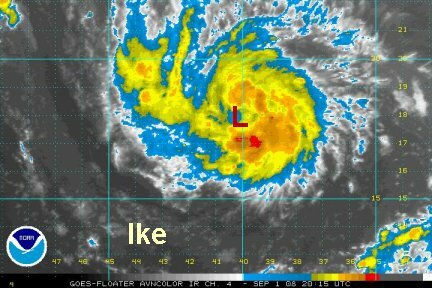 Ike's satellite presentation looks impressive again. NHC has it to 80 mph. This looks like a good estimate to us. We also think that NHC has a decent handle on the track at this time. It should move south of due west toward the Bahamas, then possibly have more of a northwesterly motion as it approaches Florida. All residents of the northern Caribbean, Bahamas and Florida need to watch Ike carefully. 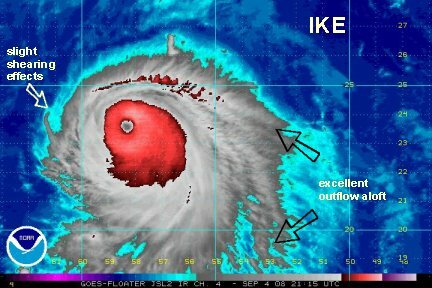 Ike has the potential to become a dangerous hurricane. The time frame is a little slower. IF Florida is to be effected, it looks like early next week. Ike's has exploded the last several hours. The eyewall is very thick and the cloud tops have cooled. NHC's estimate of 115 mph looks reasonable to us. The models take this hurricane toward the Bahamas by the weekend. It appears that the northern Caribbean Islands are a lesser chance, although we would like to see a few more model runs to confrim this. One model actually has it recurving <i>east</i> of the Bahamas. We're not going to jump on that, but its something that we will be studying very closely! 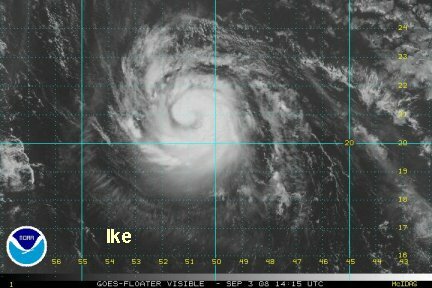 All interests in the Northern Caribbean, Bahamas, Southeast U.S., and Bermuda should follow the progress of Ike. 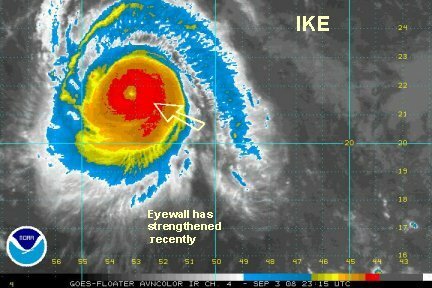 Ike is a dangerous hurricane and growing rapidly in strength. Ike was cranked up to a cat 4 on the 11 pm ast advisory at 135 mph. We think that Ike topped out shortly after that by a few hours. Our best guess would be 145 mph. The cloud tops had continued to cool after the advisory time. Since then, it appears that some northwestwesterly flow from around Hanna is causing a little shear to the western eyewall and trying to weaken Ike some. It's probably back to 135 mph. The strength will depend on any shearing winds from the west and any eye wall replacement cycles that begin. So far we haven't noticed any. The forecast is still a wild card. The window is open afer day 3 from the northern Caribbean to recurving west of Bermuda. It should be forced south of west for a while putting a scare into the Bahamas. After that will watch for the recurve. One of our favorite models has had two runs now of recurving Ike east of the Bahamas. Let's hope it's right. The latest forecast models are coming into better agreement for the next few days. A high pressure ridge should guide Ike a little farther south of west. After that, the questions come in. The models are saying that Ike will recurve, but when? Some are east of the Bahamas and offshore of the U.S., others are over the Bahamas or very close to the U.S. coast. Right now, Ike remains a dangerous cat 4 hurricane at 140 mph. It is centered about 950 miles east northeast of Grank Turk. The satellite imagery shows that wind shear is nipping at its western side, but its so strong that it is sustaining itself for now. 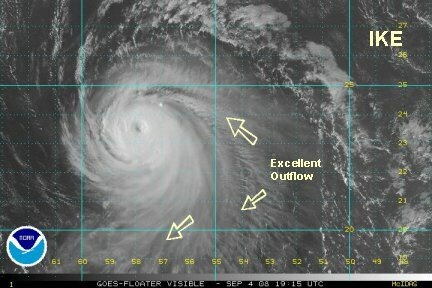 Excellent out flow is noted on the eastern side of the circulation. All interests in the Turks and Caicos, Bahamas, Southeastern. 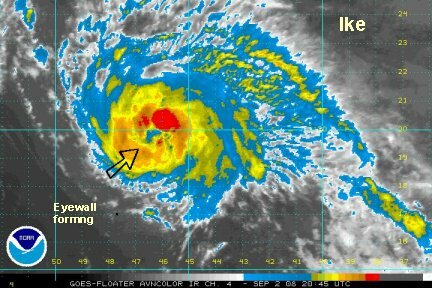 U.S. and Bermuda should follow Ike closely for this weekend and into early next week. Iks's long term future is still in doubt. Models fan out as it approaches the Bahamas. Some of the most reliable models are on opposite sides of the spectrum. Some models insist that it heads toward Cuba then into the Gulf. Another takes it into south Florida. And even another recurves it offshore. All interests from the northern Caribbean to the Southeast U.S. need to follow Ike closely. The time of concern starts this weekend into early next week. 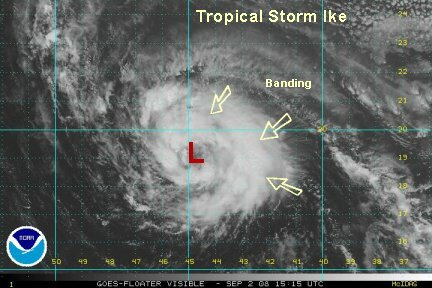 It appears that Ike has weakened a little and may have dropped down a touch. The eye still has an excellent representation on satellite. The cloud tops although, have warmed on the western eyewall due to the westerly shear. This may have resulted in some weakening. 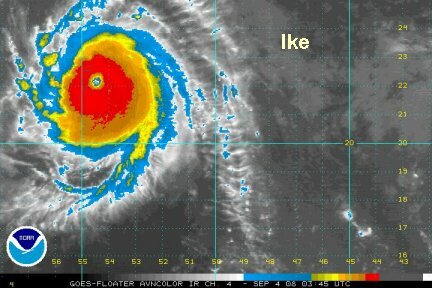 Ike is still a very dangerous hurricane! NHC has Ike down to 135 mph - a minimal cat 4 hurricane right now. This appears to be a good estimate. Wind shear is still taking its toll and Ike is becoming more asymmetrical. It still has a very impressive inner core in which the westerly shear has not been able to degrade much. Its possible if the shear continues that Ike will be downgraded a bit more on the next advisory to a strong cat 3. The forecast tracks are still very worrysome. Ike may go as far south as Cuba or northward into the Bahamas and recurve near or into the Bahamas staying barely offshore of the Southeastern U.S. We don't know the intensity or exact track yet....either do the models. We need to wait until a consensus of the models develops. Don't panic and don't listen to the media that will panic you. They don't know where it's heading yet either (unless they make one very lucky guess!). Stay calm and stay informed! A computer error erased our early AM Ike update, we are sorry for the inconvenience. Last edited by Caribbean Traveler on Fri Sep 05, 2008 9:54 am, edited 1 time in total.